Up until about 1973, My Grandparents and my Aunt & Uncle jointly raised a pig every year. They’d go in together, buy it, and Becky & Jr. would house the thing on their farm up in Woodstock. Come late fall, they would kill it and the family would share in the pork bounty through the winter. Now – there’s something you need to know about my Aunt – she collected broken animals. Whenever you’d go to the farm, you could ride the blind mule, chase the one-eyed chickens, tease the tailless cat (it had gotten caught in somebody’s tractor) and as always, play fetch with one of the “five” three-legged dogs. So, knowing my aunt’s disposition towards animals, you know she would have to name the pigs. They always had names like Elmer, Porky…Bob – and getting close to killin’ time, she would always become sad because she had grown attached to the very large grunting beast down in the pen. So that last year, back in ’73, when they got their last pig, Becky was confident that she wasn’t going to get sucked into feeling sorry for the pig this time. … they named the pig “Sausage and Ham”. But standing outside and calling Sausage & Ham at meal times just got to be too ridiculous, so she shortened the name to something more manageable. We slaughtered “S & H” that Thanksgiving, and Becky was once again maudlin at the loss of a friend. Now – I’ve butchered a lot of meat over the years, and killed my share of live things to eat. But nothing…. nothing can describe the carnage and assault on your senses that accompanies the slaughtering of a 500 lb pig. I have no intention of going into that process here. I’ll leave it to say that we cut, cooked, rendered and ground every part of that animal. The old saying is indeed true – “You can eat every part of the pig, except the squeal”. However – if you are interested in the process – you can read all about slaughtering a pig here. Brutal butchery aside, pork is one of my favorite meats. 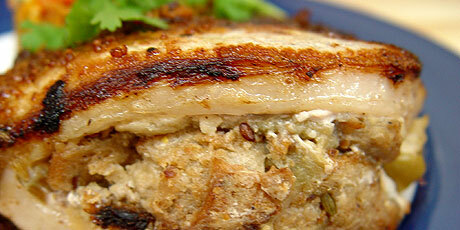 It’s versatile, easy to work with, and can be just as lean as chicken – if you prepare it correctly. I thought today I’d give you a trio of pork dishes: a Childhood memory, a Thai comfort food, and just a damn good stuffed pork chop. Whenever I make these I still think about heading out before morning on family vacations. 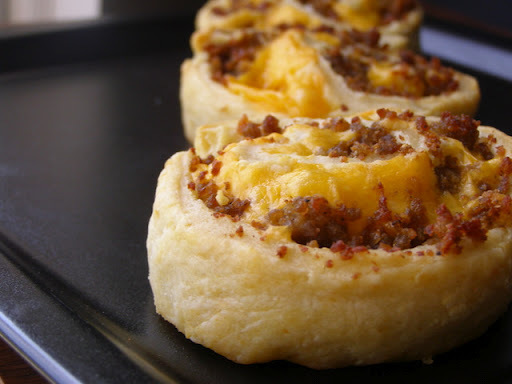 A couple of thermos of coffee and a Tupperware packed full of Mom’s savory sausage pinwheels. In a large bowl, combine the flour and shortening. Cut the flour into the shortening with a pastry cutter until the mixture resembles coarse cornmeal. Add Buttermilk and stir well until blended. Roll dough into an 18″x12″ rectangle. Spread the room temperature sausage covering the dough, leaving a 1/2″ margin on sides. Sprinkle the cheese evenly over the dough. Roll dough lengthwise, jellyroll fashion, pinch the seams and ends to seal. Bake at 350 for 20 minutes or until brown. I had a good friend in Atlanta that was Thai/Chinese. 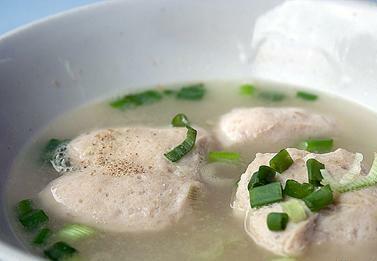 Whenever he got homesick, he always made a big pot of Pork Ball Soup and invited me over. Use your hands and mix well. Cover and chill in the fridge for about 30 minutes. Reduce heat to medium and simmer for 3-4 minutes. Remove the meat from the fridge and form into meatballs (about the size of a golf ball). Add the Cabbage, and black pepper and continue to simmer just until the cabbage wilts. Serve with fresh steamed rice. The recipe calls for Hickory nuts. They have a sweetness and earthiness that other mass harvested nuts just can’t provide. You can buy them online here. However, if you just cannot bring yourself to spending $20 for nuts, you can substitute 1/2 Cup of Pecans and a 1/2 Cup of Pine Nuts for the Hickory nuts. The pine nuts will give you some of the depth that pecans alone are missing. Add the hickory nut meats and heat for another minute. Add the pork chops and cook uncovered for 8 minutes on each side. Check about 4 minutes into cooking to make sure they are not browning too quickly – if they are, adjust the heat down a little. I love LOVE that you have not one but three recipes! Yum o yum.